Fujifilm has announced the F800EXR, a camera with a 16-million pixel sensor. That sensor is a BSI (Back Side Illuminated) EXR-CMOS sensor, which, promises Fuji, gives it the best image quality possible. Intelligent EXR Auto automatically selects the optimum shooting mode from 103 patterns, dependent on the demands of the scene being shot. A Fujinon 20x optical zoom lens offers a 35mm equivalent of 25-500mm. It is also equipped with a digital zoom which can boost the camera's capability to 40x zoom. According to Fuji, the Intelligent Digital Zoom offers "optimum image processing to counteract the image degradation that traditionally occurred when digital zooms were employed". A speedy start up time of just 1.5 seconds is promised, while there's also a shot-to-shot time of just 0.8 seconds. AF speed is expected to be as little as 0.16 seconds (at the shortest focal distance). Users of smartphones and tablets can receive images from the camera (via a free app), allowing images to be uploaded to social networks or emailed via the phone. An app can also be downloaded to record the location of a photograph by sending it from a smartphone/tablet to be displayed on the camera screen. Other features include a number of artistic Advanced Filters such as Toy Camera and Partial Colour, full HD video recording, raw format file capture, 360 degree motion panorama. 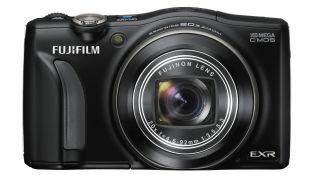 The Fujifilm FinePix F800EX price will be around £279 (approx. $430) and it will be available to buy from the end of September.